IMMIX CS has the largest integration library in the industry and provides a single, central alarm monitoring interface for operators to interact with these systems in an easy and repeatable way. 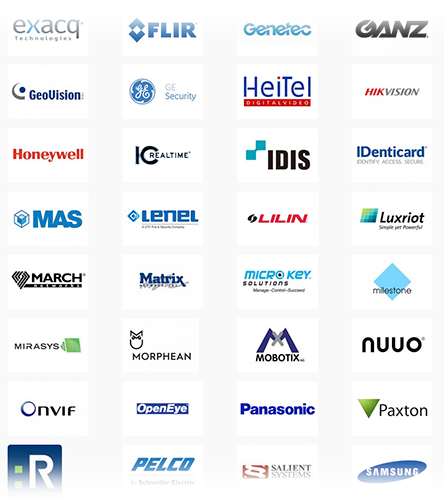 Immix® CS is a software product that operates in your Central station and consolidates a wide range of different security products into one simple operator interface. Immix® CS is designed to help you deliver new video based services to your customers, build your recurring revenue and complement the investment you have made in your existing automation system. 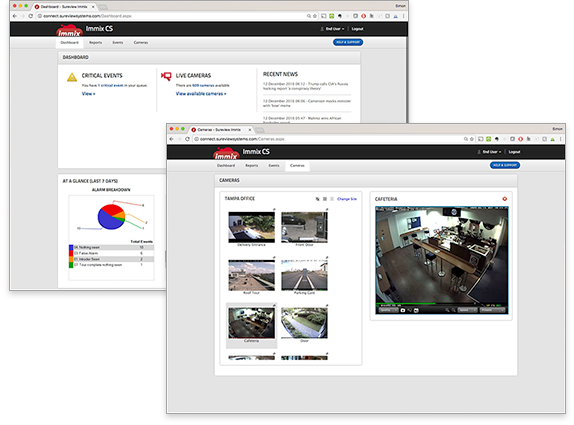 Its proven to increase dramatically the efficiency of central alarm monitoring stations offering next generation video monitoring services. 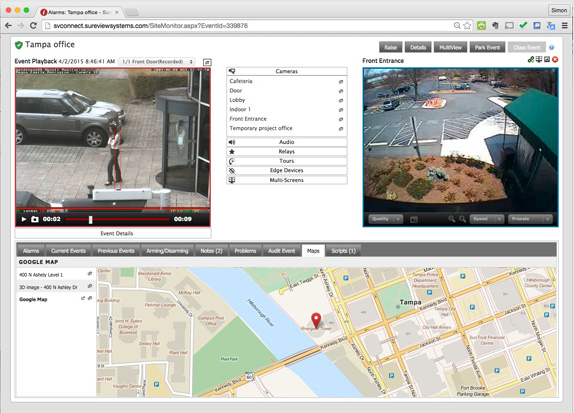 G4S provides interactive monitoring services using Immix from central stations in North America and Europe. Chubb runs one the largest stations in the UK using Immix CS for their video monitoring and interactive services. 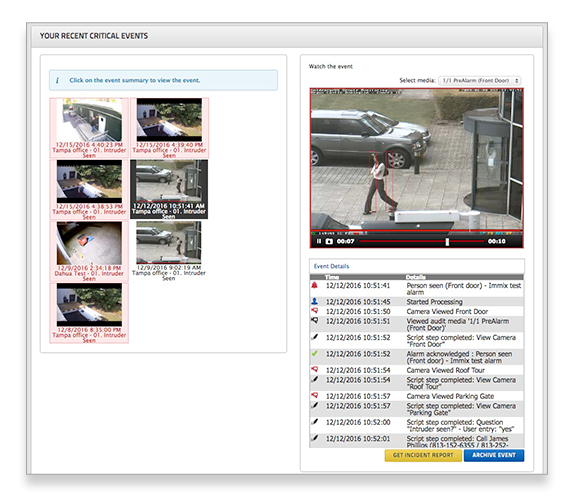 Throughout Europe and South America Securitas uses Immix CS to provide that latest in interactive monitoring services. SureView is Securitas’ global technology partner for our Remote Guarding services and as we expand our offerings in the US market, in line with customer requests, we have looked to them to provide a managed services platform for our corporate customers. These latest developments allow us to provide additional technology and manpower solutions to the Protective Services industry. These services can range from basic alarm verification to interactive access control, and can be buffeted by the deployment of Mobile Guarding solutions. We can also provide the option to outsource temporary monitoring or an entire security operation center (SOC) to our state-of-the-art facility in Charlotte. By combining this technology with the expertise of our Protective Services team we can now offer an end-to-end service that is more flexible and cost effective than ever before. 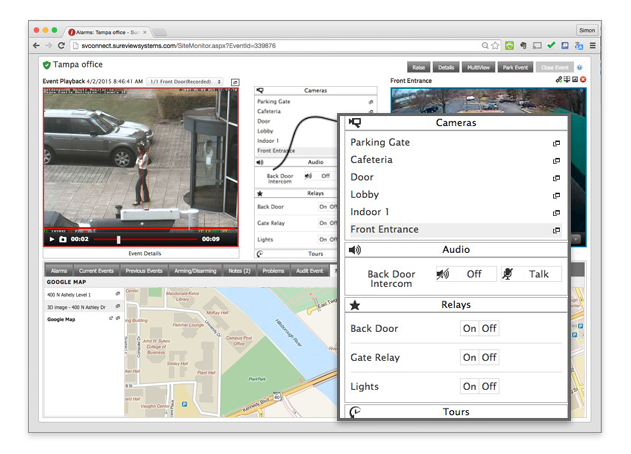 "We have been with Sureview since we began offering video monitoring services over ten years ago. In that time they have consistently exceeded our expectations and provided us with the tools needed to support a number of different customers using a wide range of video products. It is because of their high level of support and easy to use monitoring platform that we have been successful in growing our video monitoring business year over year"
Regardless of the product technology, the operator view is always the same. Everything the operator can see, and every action he takes, can be recorded and audited at a later date in line with police requirements. It also enables us to monitor system performance and manage staff levels accordingly. Once Immix was installed, we were able to standardize on a single process which brought excellent efficiency savings. We were then able to grow our remote monitoring services by taking on many different types of connections and providing different levels of service for our customers. WHAT’S UNIQUE ABOUT IMMIX CS? Immix connects to lots of different types of systems and devices, and the strength of Immix is its ability to mix the features and functions of these systems into one service delivery platform. For instance, you could create a remote guarding service for a parking garage where if a customer triggers an alarm for help with the ticket machine, Immix will receive and verify the customer via video. The operator will then open an audio channel on the intercom to talk to the customer to understand the situation, opening the gate via another system. Everyday Immix customers create new and unique services based upon the flexibility of the platform. Immix records everything the operator saw, said and did while processing an event in Immix. This audit trail provides complete transparency for your operation, never again will you ask what did they see or do when they responded to an event. This audit trail can be shared securely with your customers, providing them the insight and confidence of the services you provide. This audit trail is available to be shared with back office systems, most commonly with your existing automation or reporting systems. Immix is a 100% browser based platform providing the flexibility to create your own unique branded web portal. We have created a customer user role that provides your administrators the control to tailor the view you provide to your customers. This customer view can include access to the multimedia audit trail of event, live cameras, reports and dashboards and can be filtered to all their sites or just a single site – you control what they see. WANT TO LEARN MORE ABOUT HOW IMMIX CS CAN BROADEN YOUR MONITORING SERVICE?